Water polo is a fast furious and physical watersport and its safe play requires players to be fit, strong and skilled swimmers. 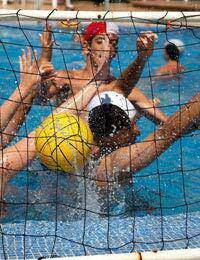 Water polo is a competitive team water sport best described as a fusion of handball, rugby and swimming. Like handball, the aim of water polo is to score more goals than the opposition during a set period of time. The ball is similar to a football but waterproof. The court is a standard rectangular swimming pool, principally arranged much like a handball or football pitch, with a goal at each end. The teams are made up of six outfield players and one goalkeeper. The rules forbid all players apart from the goalies from touching the floor of the pool, also they don’t allow holding the ball with two hands or dragging it underwater. If water polo takes its match play principals from handball, then it takes its physical nature from rugby, a relation that harks back to the sport’s origins as ‘water rugby’. Holding and pushing other players is allowed, but only if they are holding the ball. This rough nature means a typical match features a lot of wild tugging, grabbing, and players pushing and pulling one another underwater, and not all of it allowed. There is therefore always a risk of injury. Nevertheless, water polo is a relatively low risk sport, aided largely by the protection the water resistance provides. Those most vulnerable to injury are those who are not physically prepared both in training and in pre-match warm ups. A good water polo player needs to be very fit, strong and fast at swimming. It is also a very physically draining activity. Staying afloat for long periods of time would put a strain on most people, but water polo throws frenetic action and brute force into the mix, making it a particularly demanding sport, and not one for the meek and faint-hearted. The demands of the sport as a whole can be overwhelming for the young beginner and for this reason there is an easier variation called ‘flipper ball’, which permits players to stand up in the water. Water polo players need to be in tip-top physical condition to perform well and with a low risk of injury. They achieve this by undertaking a general strength and fitness program, which could include weight training and aerobic activities that improve muscle strength such as swimming. On match day players are advised to begin by warming up thoroughly with lots of sustained stretches. Likewise afterwards players should cool their bodies down with further stretching. These exercises are essential to prevent muscle injury. Firstly water polo players need to be strong swimmers because they will need to be able to swim a 30 metre pool non-stop many times during a competitive game. The key strokes are front crawl and backstroke, modified so that the players keep their head out of the water to observe the field and switch positions if necessary. As participants are only allowed to touch the ball with one hand, ball handling is the second key skill. Players must develop the ability to catch and throw the ball with either hand as well as catch it from any direction. Thirdly, as touching the bottom of the pool is forbidden, players must be proficient in the art of treading water. The most popular form of water treading is the ‘egg-beater’, a movement familiar to synchronised swimmers and so named because the circular motion of the legs resembles the movement of the eponymous kitchen utensil.